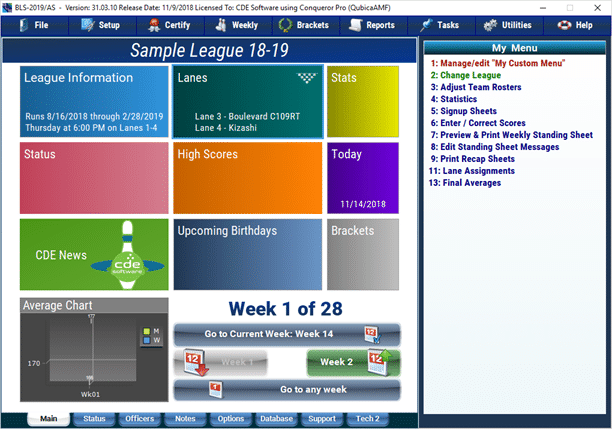 The best bowling league secretary software, supporting both scores and financials. 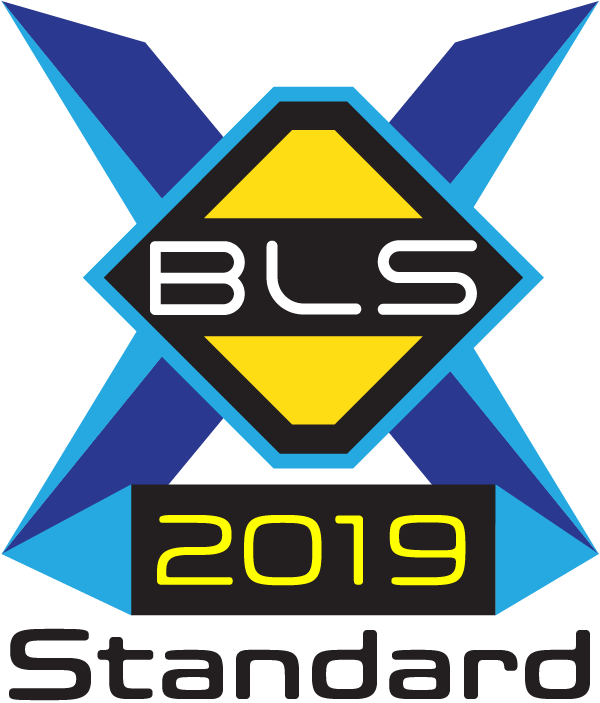 BLS-2019 Standard promotes the best league software for Windows. CDE Software uses its over 40 year experience with bowling software to provide the most comprehensive and best league software in the industry that is powerful, yet easy to use. Easy navigation to get at functions, organized in a manner that follows the league season. Dashboard highlights information about the league. Run as many scratch or handicap leagues on your computer as you wish. Leagues can be men, women, boys, girls, adults only, youth only or adult and youth. Bowl up to 6 games a week with up to 12 bowlers on a team and up to 190 teams per league, bowling a maximum of 97 weeks per season. Built-in financial module to manage finances for the league. Supports and is recommended by the United States Bowling Congress, Canadian Tenpin Federation and The National Bowling Association for the 2018/19 bowling season. Flexible reports and standing sheets. Embellish reports with logos, different fonts and other ways to distinguish your league from others. BLS-2019 uploads league standings to the popular LeagueSecretary.com website, where bowlers can view their standings online or with a mobile application. USBC’s Bowl.com and personal websites are also supported for standings uploading. 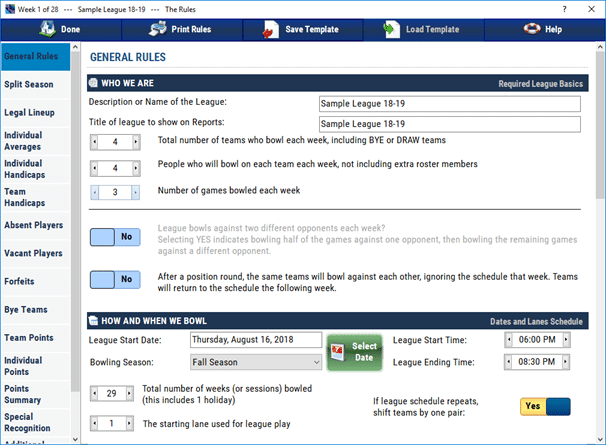 As leagues can have simple to complex rules, BLS-2019 offers a logically organized configuration screen to configure the league rules. Basic text in the bylaws for things like “bowlers will be fined $1.00 for not wearing a team shirt” can be entered for printout of the league bylaws within BLS. Our BLS-2019 Standard edition is similar to the former Perfect Secretary Standard by Treasure Software, which closed their doors in Spring 2018. If you are a former customer, there is a importer function in BLS-2019 to assist with conversion to BLS. Download the program installer and install the software. The software will run in Demo Mode allowing you to check out the sample league and check out most program features. Purchase from our online store when ready or call our sales department to place the order by phone. BLS-2019 Standard is our popular edition for management of bowling leagues. This edition is part of our consumer products, which are editions used at home. Bowling centers needing the industrial edition that integrates with the scoring system will need the BLS-2019 AutoScoring Edition product. BLS-2019 Standard is designed to make your work easier and enjoyable to where you will always want to be the league secretary. The United States Bowling Congress (USBC) is supported along with the Canadian Tenpin Federation (CTF) and The National Bowling Association (TNBA) and includes forms, sanctions, membership cards & awards for use in the 2018/2019 bowling season. 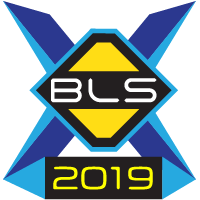 BLS-2019 features easy menu navigation in a manner organized with how a league operates throughout the season. Easily navigate between weeks and the league calendar is always handy. This league software features unique Internet enabled features, including sending email, with our without attachments, to your league members. Also, only BLS can support uploading standing sheets to LeagueSecretary.com, Bowl.com and your own personal websites. Manage as many leagues as you wish (Why pay more for each league or # of teams). Manage men, women, mixed and youth leagues. FREE- Extended Product Downloads – Why pay $39.95 extra that other companies charge to download the installer for your program in case you misplace the installation program, moved computers or the installer was corrupted or damaged by a virus. As long as the the program has not reached end-of-life, the installers are available for download FREE without any special passwords or confusing security codes. Up to 6 games of bowling per week. Up to 190 teams per league. Roster sizes up to 12 per team. Up to 95 weeks per league. Men, Women, Boys, Girls, Adult, Youth or Adult/Youth league support. Up to 8 splits in a season. Reset specific items when a new split is reached, such as team points, team pinfall, score recognition and more. Rank standings by the split or by the season. Configurable legal lineup minimum requirements. Adjust lineups when advancing weeks, such as re-arrange from low to high average. Set requirements for use of book or entering average for a period of time. Set requirements for bowlers without a book or entering average for a period of time. Cushion average and declining cushion average support. Pin drop limits, such as pins a player can drop from book/entering average. Same or different handicap percentage and base for genders. Support for leagues adopting USBC Rule 100g-5 regarding capping of handicap scores. Absentee score by specific pinfall or percentage. Pin drop rule support for absentees missing consecutive weeks or cumulative number of weeks. Vacant bowler can be based on gender score or be based on a specific score or have a different percentage and base then others. Bye team rule support or BYE team support. Team points for game and series, handicap and/or scratch. Individual match points (bowler vs bowler) for game and series, handicap and/or scratch. Peterson points (1 pin per designated amount of pinfall). Limit bowlers/teams to 1 awards or all that they qualify for. 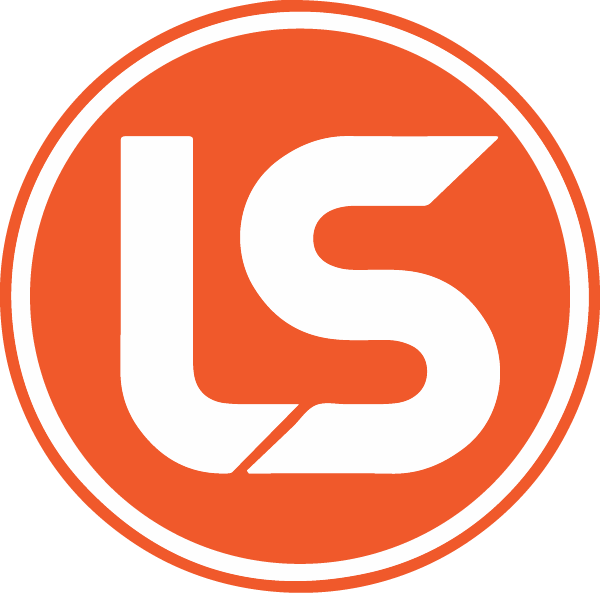 Mid-Season startup to more easily start a league in BLS when season already started. Bowling against two teams per week. Multiple teams per lane support. Easy to use score entry screen. 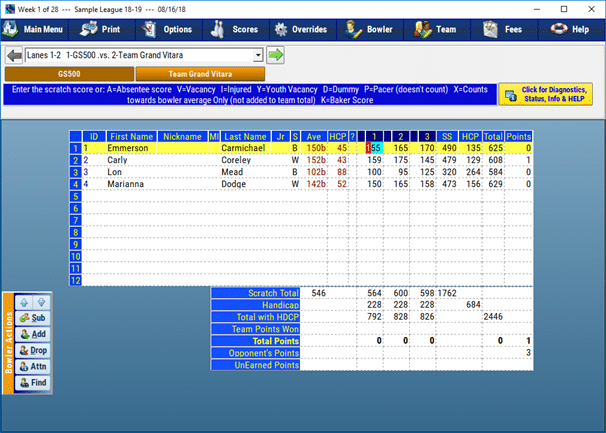 View calculated columns to assist with diagnosing questions, such as scores with handicap, average of bowler per game, etc. Generate export file for WinLABS league average import. Prints USBC bowler membership cards. USBC Youth Pepsi Tournament qualifications processing, including divisional changes and age changes. Prebowl / makeup scores can be designated to disqualify for USBC awards. Prints CTF bowler membership cards. Prints TNBA bowler membership cards. Standing sheet can have different league title than description for league for opening leagues. Reprinting of scores redesigned and consumes less paper and contains more details for paper trail / audit purposes. Multiple Reports are managed with customization of league standings, detailed reports, season histories and more. Single one-click upload to your websites comes standard with all editions of BLS-2019. Record payments and manage treasurer duties with the built-in treasurer module to manage league finances to track by bowler or by team. Keep track of membership card payments. Allow different pricing for regulars and subs. Product includes program installer, which also installs the program manual in PDF format and bonus clipart installer. The printed manual and CD-ROM is available for an additional $15.00 or printed manual and USB Drive is available for an additional $23.00 plus S/H.